Two weeks ago I created a new Alpha account to try out the new content introduced in the latest EVE Online expansion, Ascension. I even recorded most of my play sessions and put the videos up on YouTube, although I failed to record my commentary in about half the videos. Oops! But I wanted a record to look back on. I recorded about 17 hours of game play, which didn't include a couple of market trips and some theory crafting using the new fitting tool. I think overall I spent around 20 hours so far playing on the account. I think I have enough experience to write reasonably intelligently about my trip through the new New Player Experience, the career agents, and a few hours of play after completing the introduction to EVE. As part of the experiment, I attempted to play as much like a new player as possible. No transfer of funds from my main accounts. No skill point bonuses from using one of my referral links. Admittedly, I did use some of my knowledge about the game, but I don't think it influenced me too much. Then again, I had a much easier time getting through the exploration career agent than I had in the past. First, a word about character creation. I rushed through the process, yet still spent 15-20 minutes creating my character. EVE's character creator is a marvel even after 5 years. I just wish we could walk out the Captain's Quarters door. I still have a dream that one day CCP will convert our characters to Unreal Engine 4 and introduce some sort of avatar gameplay to EVE. I have to do a little research, but I believe that a player's choice of schools might matter. Okay, I need to do a lot of research on that. Next, the big addition to the game. the new New Player Experience. At Fanfest this year, we learned that over half the people who try EVE don't last two hours. How long did the NPE last? Two hours. If the goal was to get players to last longer than two hours, the NPE should have done the job. While I didn't have any difficulty, I heard many players did. Those difficulties could have resulted in the low numbers of players completing the NPE. According to CCP Turtle power on the o7 Show Sunday, over 30,000 players had completed the NPE. An impressive number, until one realizes that players created over 162,000 new characters between 15-23 November. Personally, I liked the voice acting, although at times I thought the dialog a bit corny. The alternating use of the faction fleet commander and Aura was effective from keeping the instructions from droning on in a single voice. A single voice has the problem of becoming monotonous. The bouncing back and forth not only between the two main characters, but the Sisters of EVE scientist as well, helped keep my attention on the instructions. By the end of the NPE, I think new players master the basic skills much better than with the previous iterations of the NPE. The main problem I have is that the quality of the content really drops once the new player starts running through the career agents. The career agents. I have to say that the optimum order of doing the career agent chain is to do the industry and business agents first, then the military and exploration agents, with the advanced military agent last. Both the business and industry agents have missions that require manufacturing items, which can take up to 4 hours for a single batch of items to complete. During my run through, I spent eight hours with the career agents, so the content exists to fill up the space. Unfortunately, I saved the business and industry agents for last. Spoiler alert: don't do what I did. After 10 hours of play, I went free-style and started doing the highest level missions I could: distribution missions. Hey, at least I wasn't mining, which some horrible people tell new players to do. I didn't do too bad either. I did sixteen level 3 missions in a little over an hour and made approximately 1.9 million ISK and 2300 loyalty points. More importantly, I managed to get a faction storyline mission. I did have to mine in a Venture for 20 minutes, but the +3 learning implant I received sold for 7.5 million ISK in Rens. On top of that, my standings with the Minmatar Republic is now 0.98, which means I have almost unlocked all the level 2 agents in all of the Minmatar NPC corporations. Not too bad. For comparison, I also ran level 1 security missions for an hour. I completed two, gaining 400,000 ISK in bounties and mission rewards, 223 loyalty points, and 500,000 ISK in salvage and drops. This hour of level 1 missions is the reason I'm so excited about unlocking all of those level 2 agents. Finally, I did a little exploring in a Probe in high sec. I managed to complete one data site with little problem, but I only received about 800,000 ISK in items. I did find a combat site and tried to run it in a Rifter. I need a lot more skills, or a Thrasher. I will say, though, that I had fun, even though most of what I scanned down were wormholes. The Probe served me well. Then again, I do have a little experience probing things down. I also have to say I enjoyed the process of putting ship fittings together that a 700,000 skill point character can fly. The new in-game fitting tool is fantastic and I wish it existed when I first started playing. I managed to put together a good Wreathe fit, pretty good Probe and Venture fits, a passable PvE fit for a Rifter, and an acceptable beginner's fit for a Slasher. I also have a Thrasher that I will learn to fly today, but I won't have the fittings for a few more days yet. After two weeks, I have 11.7 million ISK in my wallet with another 11.7 million in fitted & unfitted ships and miscellaneous items in my hanger. I still have not only the Sisters of EVE epic arc to do, but the Minmatar COSMOS missions as well. 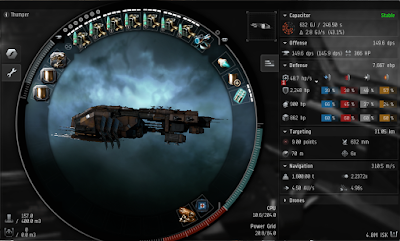 I also can join factional warfare if I pick up the pace of my ISK making. I've never farmed FW missions. Maybe I should begin. I also have a couple of ideas for something to do that I've never done on my main characters. Or maybe I'll start running Sisters of EVE missions and try to get some of those sweet SOE loyalty points. Those are usually worth something, even if I cannot fly the ships. Perhaps the most important takeaway from my experience is, despite the seeming limitations of the alpha skillset, that after 20 hours I still have so much content I can explore. The big question is, do I want to? I have three paid accounts and I just spent the last two weeks spending all my play time on a free account. Seriously, I really don't have that much time in my life. That's right, I saw two level three agents. Level three agents are better than level one agents, right? Who wants to do stupid level one security missions when I can do level three distribution missions? Besides, the career agents gave me two Wreathes. What's the number one rule of EVE? Don't fly what you cannot afford to lose. I can afford to lose a Wreathe, because I already have a backup. So with the helpful prodding of CCP, I prepared to do distribution missions. Judging by my blog statistics, I was not the only one thinking that way. since the launch of Ascension, I receive a lot of hits on my "Mastering The Wreathe" post every day. So why not use my own work to start the fitting process? I couldn't go crazy because I only had 6.7 million ISK and a little under 600,000 skill points to work with. Also, in the spirit of the alpha experience (and that pyfa was giving bad numbers), I'm using the numbers from the in-game fitting tool. At an estimated worth of 2.7 million ISK, I think I built a nice little fit. I left the high slots empty because, expect perhaps a Salvager I, the ship really doesn't require anything in the highs. The low slots are set up for optimal performance for level 3 distribution missions. If I recall correctly, no level 3 Minmatar distribution mission requires more than 4,200 m3 of cargo space, and the fit above will hold 4,939 m3. The fit also makes use of 3 of the 4 Expanded Cargohold Is I received as mission rewards from the career agents. I also picked up one of the inertial stabilizers somewhere along the line, so I only needed to purchase one additional stabilizer. The mid slots show an effort to maximize the tank of the Wreathe. The meta afterburner is used instead of a micro-warp drive (MWD) in order to fit larger modules. The Wreathe has a major shield resistance hole for electromagnetic (EM) damage, so I purchased an EM Ward Amplifier I. 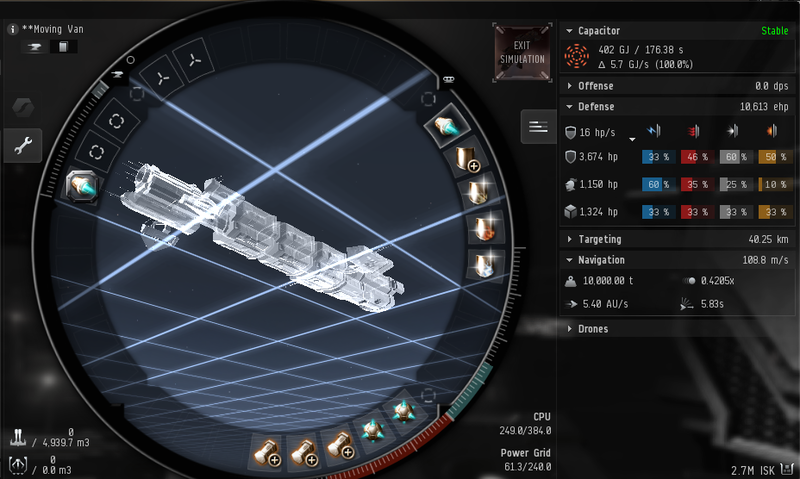 The Thremal Dissipation Amplifier I is present in the fit due to the prevalence of the Catalyst in suicide gank fleets. For my industrial ships, I try to defend against the thermal/kinetic damage the Caldari ships produce. I should add one important note about the shield tank in this fit. I chose to use shield resistance amplifiers instead of a shield hardener because in case of a gank, the player doesn't need to remember to turn the tank on. The tank is running full out the entire time. All a player needs to do is crash the gate and jump back through to safety, assuming no bumping or tackle is applied by the ganking force. For rigs, I only filled one of the three slots with a Medium Hyperspatial Velocity Optimizer I. With only 6.7 million ISK, the 1.7 million ISK cost of buying one took a big chunk out of my wallet. But just adding one increased my warp speed from 4.5 AU/second to 5.4 AU/second, giving the Minmatar hauler a warp speed just a shade slower than an assault frigate (5.5 AU/second). Eventually I will fill all three rig slots, although I may only install one more warp speed rig. Surprisingly enough, one large meta shield extender gives more protection than two basic medium shield extenders. With the slot freed up by using a large shield extender, I added a Kinetic Deflection Amplifier I. I added the module specifically to counter damage from Catalysts. As an experiment, I ran level 3 distribution missions for one hour using the first fit in this post. Okay, the fit I used only had one inertial stabilizer and four expanded cargoholds, which means for my experiment I ran a sub-optimal fit. The results, however, pleased me. In a 60 minute time frame, I completed 13 missions. If I run three more missions, I am eligible to receive a faction storyline mission that not only increases my faction standings, but also potentially gives a big payday, like a +3 learning implant, which are selling for over 9 million ISK in Jita. Of course, I could get a level 3 security mission that I can't run, but those are the breaks. 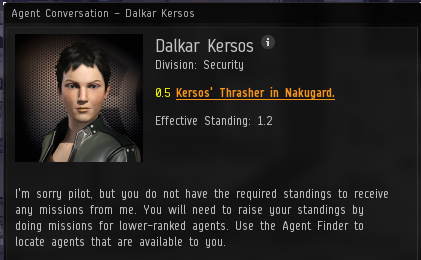 For those 13 missions, I received 1.6 million ISK and 1993 loyalty points. For new players, or those unfamiliar with EVE, loyalty points are a type of secondary currency used to purchase powerful items. The items are not bind on pickup, meaning that the player can turnaround and sell the items on the regular market for ISK, often for a tidy profit. The above screenshot shows the types of skill hardwirings I can purchase after just one hour of running distribution missions. I can get a full set of Poteque "Prospector" implants that improve all aspects of using probes by 2%. I don't know if people are doing better in other ways. I highly suspect exploration, especially that done in dangerous space, is much more profitable, both in ISK/hour and fun/hour terms. I do think, though, that I prefer distribution missions to hours of mining. 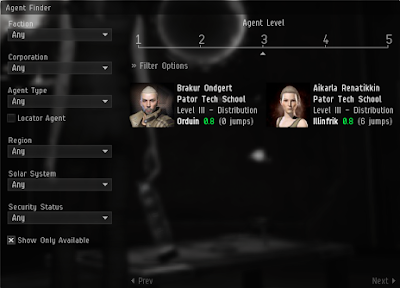 I am still running my alpha character through the career agents. I decided to do two yesterday, the exploration and business lines of missions. The exploration went a little better than expected. I guess all that practice probing down anomalies while in Signal Cartel paid off. But when I got to the last mission of the business line, I wound up rage quitting for 10-15 minutes. Why the rage? The agent handed me a 200-run EMP S blueprint copy and asked for 5,000 rounds of ammunition. Oh, and I had to make the ammunition myself. What?! First, let me back up a bit. Throughout both the new New Player Experience and the career agents, players are guided to use EMP S ammunition. That doesn't even make sense, given that the main NPCs new players fight belong to the Angel Cartel. EMP S is a type of ammunition that does 75% of its damage using electromagnetic (EM) damage. The Angel Cartel is most vulnerable to explosive, followed by kinetic, damage. The rounds that players should use against the Angel Cartel are Fusion S, which consists of 83% explosive damage, with kinetic damage making up the remainder. EMP ammunition works great against the Amarr Navy, but new players don't run into the Amarr. Logically, by the time I am asked to manufacture ammunition, the agent should ask me to create Fusion S, not EMP S, rounds. The manufacture of Fusion S rounds requires isogen, pyerite, and tritanium. Isogen is found in omber and kernite. In Minmatar space, omber is found in any 0.6 security system and below while kernite is found in 0.4 systems and below. Given that information, a new player should stumble upon isogen-bearing ore. Even if the player manages to wander out of the Minmatar Republic into either the Ammatar Mandate (Derelik) or the Amarr Empire (Devoid), once the new player enters a 0.6 security system, all the new player needs to do is warp to a belt in a Venture, fill up the ore hold, and return to base. Simple. With EMP S rounds, the instructions are misleading. EMP S requires nocxium, not isogen, to build. The agent helpfully tells the new player that nocxium is found in pyroxeres (0.9 security and below), jaspet (0.4 security), hemorphite (0.2 security) and hedbergite (0.2 security). The only problem is, of the four ore types, only hedbergite is found in the Minmatar Republic. So what can happen is that the new player, thinking he only has to go to a 0.9 system, goes to belts looking for pyroxeres. How much time is the new player going to spend looking? I don't know. The problem is worse if the player goes into low sec looking for jaspet. Not only will the player not find the jaspet, but might wind up on the wrong side of a kill mail. In a best case scenario, a true new player may have heard that mining is cancer and never do it. In that case, the player goes to the nearest market, buys the materials, and produces the 5,000 rounds that way. In the worst case, the player wastes a lot of time looking for ore in places the ore does not exist, gets frustrated, and rage quits the session. I, on the other hand, am not a new player. After realizing my character only had 5 million ISK, I hopped on Dotlan and found that Jask, in Derelik, was the nearest source of nocxium. So I headed out that way and filled my Venture's ore hold with viscous pyroxeres, and returned to the station. Did you know manufacturing 5,000 rounds of EMP S takes almost four hours? So I started the process, logged off, ate dinner, took a nap, and listened to a podcast. I logged back in with one minute left on the job. Once the job completed, I opened up a conversation with the agent, hit the compete button, and received a Wreathe plus 206,000 ISK as a bonus for completing the mission within the allotted time. I then logged back out. Seriously, 4 hours? Okay, I get to use the remaining 150 runs on the blueprint copy, but the ammunition is the wrong type to use against the local NPC pirates. 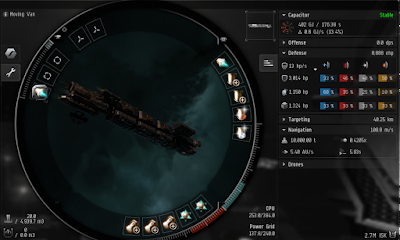 I know this suggestion is too late, but CCP needs to change the ammo type to Fusion S and reduce the amount of ammunition required to produce from 5,000 down to perhaps 1,000. On Thursday, I wrote about how unexcited I was about the new NPE directing me to the career agents. The experience with the final business mission is worse than I remembered. Hopefully CCP does a fix before doing a marketing blitz to attract new players to the game. A four hour AFK mission? Ugh! 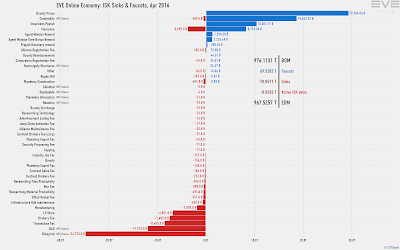 Usually, the move of an established MMORPG to some sort of freemium or free-to-play business model results in an initial surge of new players flooding into a game. So far, all indications available to the public show that EVE Online is experiencing the same phenomenon over the first three days of the introduction of the Alpha and Omega clone sets. Note that the top three dates are the first three dates of the Ascension expansion. But the list also shows that a lot of character creation does not necessarily result in long term concurrent usage, as two more of the top six character creation dates also occurred during 2016. 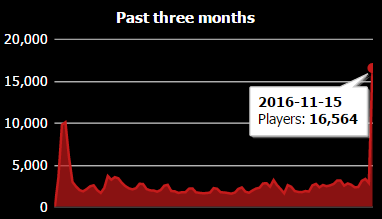 But the number of players online is up. Here are the peak concurrent usage numbers over the past four days. Anecdotally, I can report from the numbers in Rookie Chat, which is made up of all characters online less than 30 days old, that new characters seem to make up 10-15% of all logged in characters. This, to use a technical term, is a good thing. Personally, on Sunday I expect the PCU number to exceed the mark for 2015 (45,637) and exceed 50,000 for the first time since around March 2014. The question is whether CCP has improved the new player experience enough so that a sizable portion of the players stick around. I finished up the new New Player Experience last night. I jumped through a stargate for the first time, visited a couple of sites outside the new player system, and returned via pod express. At the end of the session, I was left with one thought. Meh. I only had two major problems with the second half of the content. The first involved the use of the autopilot. No. Just no. Friends don't let friends use the autopilot. Yes, the autopilot feature is very valuable in picking out a course to a destination. But please, don't make players have to push the auto button in order to advance to the next step. At one point, one of the tool tips completely covered the autopilot button and I had to scramble to figure out how to move the UI element to the top of the screen in order to push the button. Ugh! The second is the use of the redeem feature when I received new items from the fleet commander. Look, I realize that with the conversion to a freemium model, acquainting new players with how to redeem their purchases from the cash shop is important. But players really shouldn't get used to the fact that their mission rewards come from the same place as their cash shop purchases. Please, don't blur the lines. Not that the second half of the two hour experience didn't have its moments. The fight where I tackled a carrier was cool (although I should have used a scram). The visit to the Asterhaus and the subsequent fly through the Minmatar fleet had me rubber necking like a new player. And I have to admit flying into the final fight was pretty cool. The sight of a Drifter battleship slowly disintegrating and finally exploding below me was great. And this final part of the fight is pretty epic. The video should begin at the 1:00:00 mark and lasts 2 1/2 minutes. (Warning: strong language involved and is not safe for work). The "meh" thought occurred because of the message Aura delivered when I woke up back in the station. The fleet commander left me a Venture, a Rifter blueprint, and the advice to go to the career agents. The career agents? Ugh! What a buzz kill! The real problem I have is that we had two hours of voice-acted content and players are now sent to the career agents. That's a pretty big drop in the quality of the content. I really hope that players don't look at that and have a "Tortage" moment where they feel they are the victims of a bait and switch. The good thing CCP has going for them is that most of the players who may object aren't paying for the game, so they may stick around anyways. Hopefully by then the new players will have learned that the real game is played with other players. Still, I can see where players could think differently. I plan on continuing documenting the adventures of my new alpha clone character. I just have the feeling the next few sessions won't have the attraction that these first two had. A lot of people created alpha characters yesterday. How many? Possibly a record number. Of course, a lot of veterans curious about the feature created free accounts to try out the new New Player Experience and how alpha clones work. I know I did. The process of creating an account was easy enough. I didn't have to worry about downloading the client, so I just filled out the information, verified my email address, attached my Google Authenticator app to the account, and away I went. I should add that I'm glad that CCP allows players to use 2-factor authentication on free accounts. Not all publishers do. I wish I could apply 2FA to my Star Wars: The Old Republic account, but I guess EA/Bioware believes security is for paying customers. The character creation process is pretty much as I remembered it. EVE has one of the most detailed character creators around. Even relatively rushing through the experience, I still spent 20 minutes creating my character. Too bad we can't leave the studio apartments we stay in when docked up. I hope one day CCP will redo avatar gameplay in Unreal Engine 4, but that's just wishful thinking. I created a female Sebiestor Tinkerer. Yes, I went hard mode with the Minmatar, although I hear some people think the Amarr are worse off. I originally wanted to create a male character, but I fell in love with the name and gave in. I have a back story floating around my mind for my character. If I had created a male character, I would have chosen the Rebel ancestory. I need to write the idea down. I think I may actually have a good story. Upon hitting finalize, I was immediately thrown into the tutorial, with a voice actor playing Fleet Commander Valdari giving me the background of my current situation in space. Also, my introduction to Aura. I don't think the voice of Aura is bad in the tutorial, but the words flow too fast when she says "warp drive active." As I stumbled through the first part of the tutorial, I have to admit I liked the text that floated in space designed to show elements necessary to completing the tutorial easier. Except, that is, when the text covered up my capacitor and hit points. That was annoying. Especially when I'm into half-armor. Or at least, I think I was at half-armor. I couldn't tell because the UI element was in the way. Having gone though the old NPE which was walls of text, I think the voice acting does a much better job of transmitting information. I do have to say I wish the instructions came just a tad faster the first couple of times I fought against the NPCs. As I running through the tutorial, I was a bit concerned that my Reaper wound up with an armor tank while the skills an alpha clone can train are weighted very heavily toward shield tanking. Upon reflection, the tutorial is not just for alpha clones and Minmatar ships often can fit both an armor or a shield tank. Still, I can see where alpha players may run into some confusion. I did manage to finish the industry section that results in the construction of a civilian data analyzer. The industry section contained two improvements over the old NPE industry line. First, instead of getting sent out to an asteroid belt to mine, the fleet commander told me the fastest way to get the minerals was to raid a den of pirates. The second, and more important improvement, was that while the data analyzer was under construction, the voice acting kept me occupied until the item was ready. Under the old NPE, players were basically told to go get something to drink, or maybe even get a sandwich, as manufacturing would take awhile. I stopped at the point in which I needed to use a jump gate for the first time. The activities from the end of character creation to when I finished the last activity in the starter system took a little under one hour. In my opinion, that is pretty good pacing. Also, the tutorial presented a natural break point to return to real life. So far, I like the tutorial. From what I've heard, the tutorial runs between 5-10 hours in length. I only want to spend an hour or so each day playing on my alpha account, so I think I'll finish the tutorial sometime this weekend. Oh, and the crazy idea I alluded to in yesterday's post? I streamed the session to YouTube so I could have a copy live. The video, for anyone who really wants to see me stumble around, is below. We've seen a few different issues arise following the Ascension launch and a massive rise in ticket creation so in an attempt to get to as many players as possible, as soon as possible, we have created this article and will keep it updated with new issues that arise. If your issue does not apply to any of the below mentioned issues, please create a ticket regarding the issue you experience. All EVE accounts now require Email Verification. This is not optional and customer support can not disable it. However, pinning the account in the launcher and selecting to not ask for codes on the computer again should have the verification only happen once per computer. Following the launch all accounts were also forced through the Two Factor Code Authenticator. Although this was intended the messaging surrounding this caused some understandable confusion. The requirement here is simply that all EVE accounts have verified emails. This secures accounts in such a way that if access is attempted through unrecognized devices, log in locations or similar, a code required to log in will be sent to the email registered to the account. A point of confusion is the fact that even after going through this process, the Account Management page still lists the Two Factor Authentication as being "Disabled". When it technically is not. It can however be "Enabled" by sending a new verification code. So for now, players will have to both verify their email and go through the Two Factor Authentication step to log in (both to the client and the Account Management page). We are working on getting the messaging fixed and for the Account Management page to accurately depict accounts as having Two Factor Authentication "Enabled" when having gone through this process. Keep in mind that the Two Factor Authenticator, which requires you to log in with a code sent to an app or email each time is still optional. For each account you'll only have to go through the email verification and code verification process once. Please check your spam/junk/trash folders. Or other sub folders of your email to make sure the verification email is not being filtered there. Please do not re-initiate / re-send the verification code multiple times. You might have to wait for a short moment for the code to arrive. If you request a second code before the first has been used, the first one will become disabled. Also be aware that the Two factor code will only remain valid for 10 minutes. If you're still not getting the code please create a ticket we'll assist further. If you are using a localized version of the EVE launcher, and for some reason unable to log in. Please switch over to the English version and try again. If you are using the English version of the EVE launcher, and for some reason unable to log in. Please reset the launcher to Default. If this applies you will have to create a ticket. However, this issue will also require us to go through an ownership verification process, so please provide us with required user details (Full Name, Date of Birth, Old Email, Billing Address, and other payment information) to speed up the ticket processing. Additional gameplay issues may also be found within our Ascension Known Issues Forum thread. Again, if none of the above points properly address your issue, please don't hesitate to file a ticket. Today is the day when EVE Online goes freemium. Well, a lot of other things are happening, like turning fleet boosts into a more active activity, the introduction of new industrial structures and ships, a balance pass for tech 3 destroyers, and the use of a cool new fitting simulator. But mainly, the expansion is all about the introduction of alpha and omega clones and the ability to play EVE without paying a subscription. I am looking forward to starting up an alpha account. My quest for the Nestor is a grind. I'm almost done, but I don't want to mine anymore. Add in the horrible election and salty aftermath and I haven't really felt like playing anything, much less EVE. I think I've decided which race to play on a new alpha account. People ask why I don't just create one of each race. The answer is simple. When I play an MMORPG, I want to develop my character. That means playing the game and living through the experiences. Just letting a character sit around gathering skill points isn't as satisfying. I also want to do some things I haven't done in 7 years of playing EVE. Like PvP. Okay, I ran in fleets when I was in Eve University, but that was over six years ago. I hear that the new New Player Experience will push players to join factional warfare. One thing I have never done is run FW plexes. I hear it is quite lucrative. I'm also under the impression that if I fit a ship for PvP while running a plex that I can catch some people by surprise. In other words, I'd have a chance to win a fight. Probably never happen, but the Cubs did win the World Series this year. Also, starting an alpha clone could prove a walk down memory lane. Perhaps I shouldn't try to relive the days when I began EVE, but I'd like to try. At the very least, starting over with an alpha account will give me something to blog about. I also have a crazy idea, but I'll save that for tomorrow if I actually go through with it. I'll just close with an amusing fact I found in the patch notes. 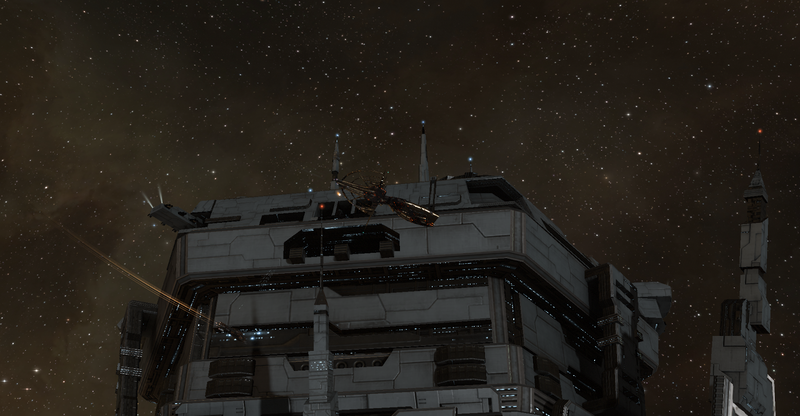 The new NPC mining operations will most often occur around selected stations owned by NPC corporations. Each of the three empires have three designated NPC corporations, but I found the Minmatar selection puzzling. The Minmatar Mining Corporation makes sense as the MMC is the main Minmatar NPC mining corp. Thukker Mix is reasonable if one forgets that the NPC corp is part of the Thukker Tribe, an independent faction from the Minmatar Republic. The third? The Vherokior Tribe. Huh? To me, that makes no sense. Then again, both of my main characters are Vherokior, and have done quite a bit of mining. I still think the choice is weird, though. Usually when a game adds a free-to-play element, the RMT crowd makes an appearance. Or, more accurately, increases its presence. With the next expansion, Ascension, launching tomorrow, now is a good time to access the activity of the ISK and skill point sellers. 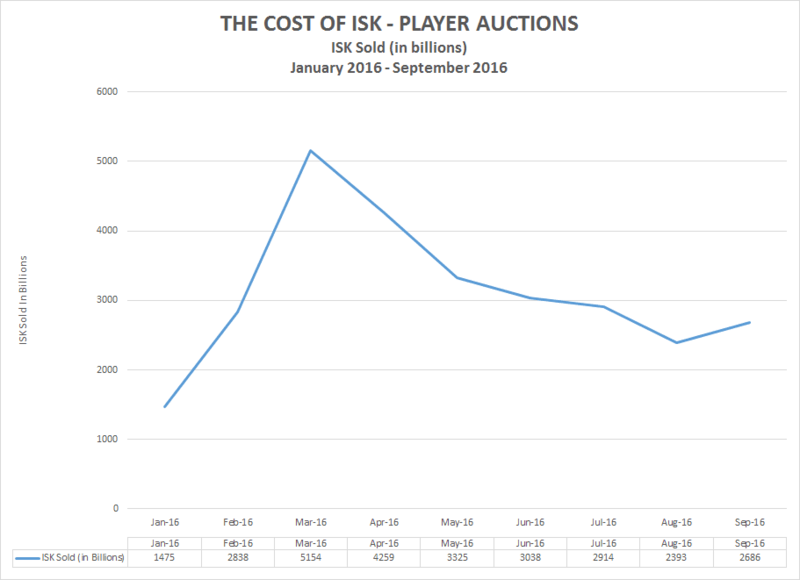 Using data collected from the multi-game website Player Auctions, one can see that the price of secondary (aka black) market ISK has remained fairly stable throughout 2016. 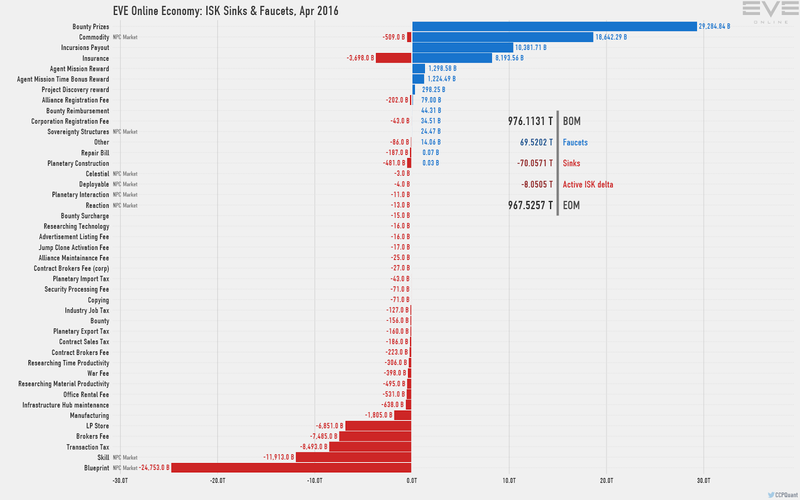 Even in May through July when the hazard discount (the difference in price between ISK purchased in Jita vs that purchased from an ISK seller) exceeded $11.50, the secondary market didn't see sellers attempt to jack up prices. The market had just enough competition to keep the sellers, except for one or two established sellers, competing for market share. One interesting development is the emerging standard that since the introduction of skill point injectors in February, the standard hazard discount is above 50%. With the introduction of alpha clones, I believe a fresh influx of PLEX is about to enter the market, raising the value of the New Eden ISK vs the U.S. dollar. 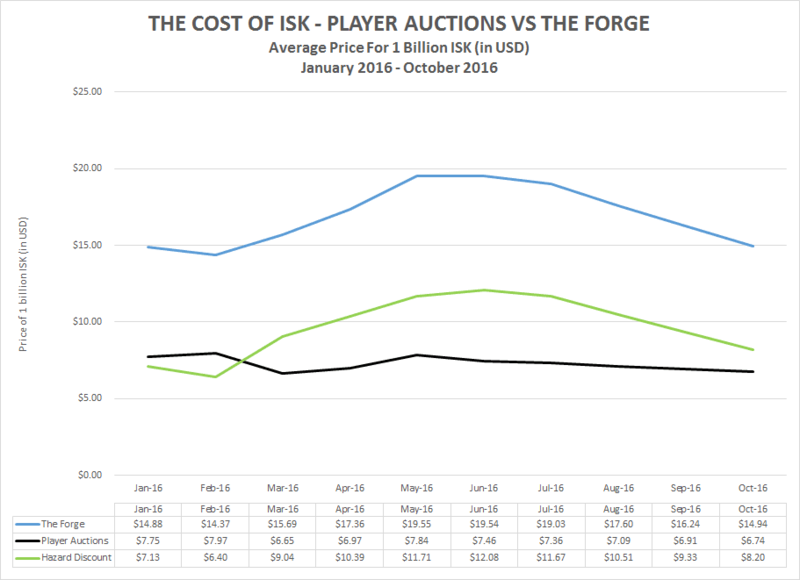 If I'm wrong and the price of PLEX raises to 1.3 billion ISK ($13.46 USD), I wonder if the ISK sellers will feel the need to lower prices in order to maintain market share. The volume of sales really peaked in the February and March following the introduction of skill injectors. The big decline starting in April was a bit misleading as skill injectors started hitting the black market. Instead of having to purchase ISK to buy the skill injectors, players could buy the skill injectors directly. 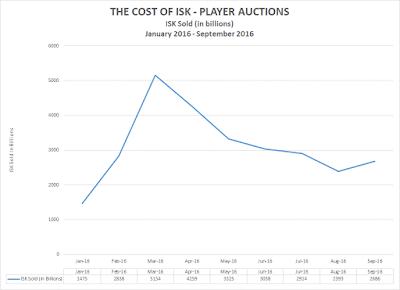 When ISK and skill injectors are looked at together, the big decline in sales did not begin until June. 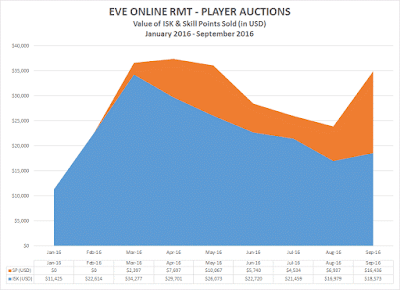 September was an interesting month, at least for the sellers on Player Auctions. I'm not sure why sales jumped so much, especially concerning skill injectors. While I do not have full sales volume numbers for October, the trend right now looks like the numbers will prove slightly less than the sales numbers for August. We may never know, but I wonder if the activity had anything to do with the large-scale RMT operation involving I WANT ISK mentioned in the EULA change dev blog released last month. I expect an increase in illicit RMT activity with the release of Ascension tomorrow. The only question is how much. The data above will help judge the magnitude of the problem. One of the things that drives me nuts about the elections for the Council of Stellar Management is when people claim if your candidate does not win that you have wasted your vote. Such BS! However, because of that type of thinking, we now have single transferrable voting for the CSM. A lot of people tell those voting in CSM elections for the first time that they must fill out all 15 spots on their ballots or they have wasted a vote. My normal reply is that the only wasted vote is one cast for a candidate you don't believe in. That usually results in my voting for less than 5 candidates in a CSM election. Today I got to put that principle to the test in real life. Both of the major party candidates, Hillary Clinton and Donald Trump, are horrible candidates who don't belong in the White House. Yet, I'm told I must vote for them. But why waste my vote? So I voted for the Libertarian Party candidate, Gary Johnson. I don't agree with him on everything, but then again, no one's perfect. So during the next CSM election, when you read me proclaiming a wasted vote is one for someone you do not believe in, that's not just me playing the EVE Online meta. That's me stating a real life belief. Because, as we all know, EVE is real. 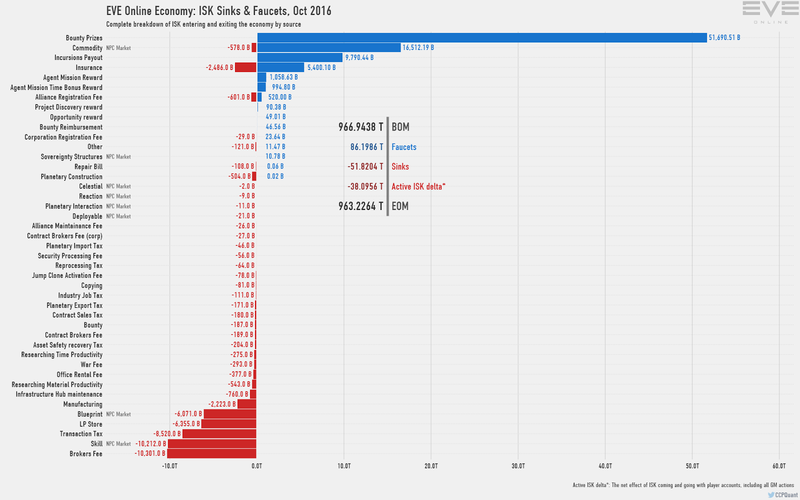 On Thursday, CCP Quant published the monthly economic report for October. Naturally, many people looked at the report trying to divine the amount of ISK lost by the shutdown of the gambling site I WANT ISK for real money trading activity. When I first saw the chart, I started playing around with the active ISK delta. The statistic measures the amount of ISK that is added or subtracted from the New Eden money supply due to accounts leaving or returning to the game, plus any GM actions. 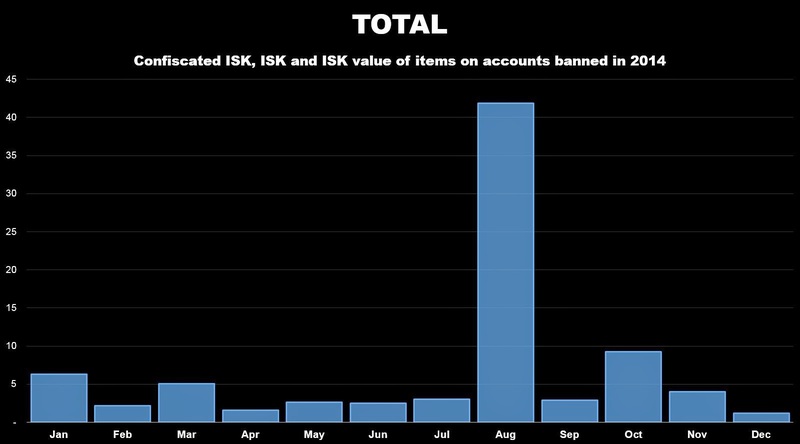 The removal of ISK from banker and their customers' wallets falls into the GM action category. The last three entries are associated with Citadel, including the launch date of 27 April. The second entry on the list is the date the dev blog announcing the EULA changes was published. 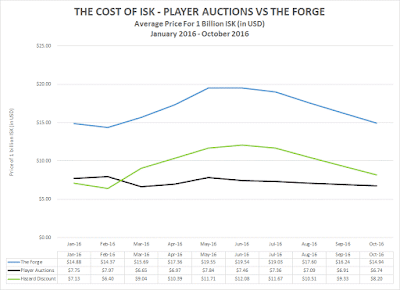 The decline in the ISK supply is probably a result of the seizing of the ISK from those involved with the operation of I WANT ISK plus the ISK sold for cash to other players. 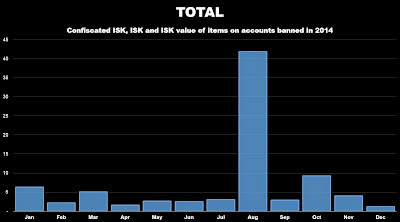 To put the amount into perspective, the amount removed from the game on 12 October exceeded the amount of ISK spent on blueprints in April. So what happened on 20 August 2014? CCP banned Somerset Mahm, the owner of SOMERBlink, for numerous EULA violations. Back in 2014, observers relied on figures released by Team Security to determine actions taken against botters and black marketeers. The above graph published in the dev blog includes assets seized and not just ISK. Back in 2014, I estimated that the Somerset Mahm ban resulted in between 33-41 trillion ISK in currency and assets seized. With the availability of ISK supply data, I now know the ISK portion of the seizure was probably around 32.7 trillion. I can't go farther with the comparisons unless Team Security releases a chart showing the amount of assets seized for 2016. 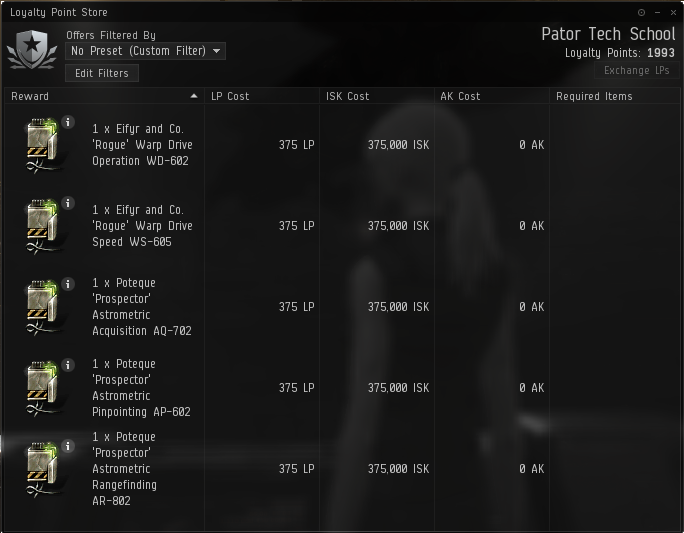 I can estimate that Somerset Mahm lost 4-5 trillion ISK in assets, including unique ships, but I have no idea the assets seized in the IWI operation. I should also add one other distinction between the SOMERBlink and I WANT ISK bans. Because Somerset Mahm was banned for non-RMT EULA/ToS violations, the totals only included the ISK and assets on his personal accounts. The ISK in the gambling sites corporate wallets remained in the game and members of SOMERBlink distributed the ISK back to players as part of the shutdown process. 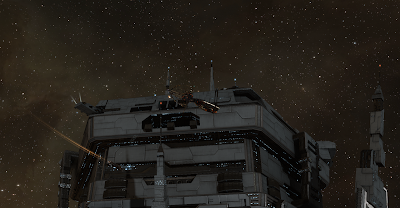 The IWI shutdown included removing ISK from a reported 100 players, including bankers and those who purchased dirty ISK. Presumably, all the ISK was removed from the corporate wallet. No matter how one looks at the situation, the amount of ISK involved is enormous. 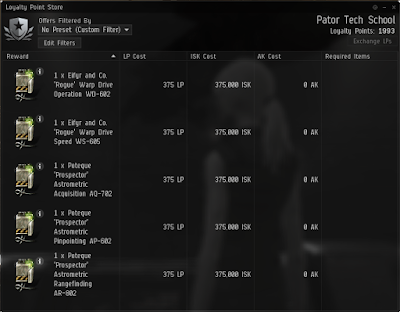 So too is the temptation to turn all of that ISK into real life cash. Hopefully by doing some conversions to game time, one can see just how big gambling organizations could get before CCP changes the rules next week. I opened up Twitter on the train yesterday morning and saw the above tweet. At first I didn't want to believe it, but I knew Dirk wouldn't play around with something so serious. Then I read Dirk's piece on Imperium News (the site formerly known as TMC). Stop now and go read it. The rest of this post can wait. Those who watched The Open Comms Show knew BigCountry was not in the best of health, but I'm not sure how many knew how sick he truly was. He didn't appear on camera anymore and I knew he was pretty much confined to bed. But reading the news was quite a shock. Comment from discussion Loss of a Friend: RIP BigCountry - Imperium. I first ran into BigCountry's work back in the days when he did a weekend rock show on EVE Radio. That was probably back at the end of 2010 or the beginning of 2011. Eventually he started broadcasting two shows a week when he began a talk show in addition to his weekend music show. I wound up searching for an iPhone app in order to catch the talk show on the train. BigCountry was full of big opinions and not afraid to let everyone know them. Some were good, and some were a little out there. Sometimes he got a little bit too excited and had to be reigned in. As rough around the edges as the big Texan sometimes came across, he also had a big heart when it came to EVE. His mother introduced him to the game and perhaps some of that attitude stuck with him. When he thought something was a scam, he was not afraid to call it out. But when he found something he believed in, he would support it full tilt. One of the hallmarks of The Open Comms Show is Tito's Homemade Vodka. Made in Texas, BigCountry discovered the drink that he and Dirk made so popular among some circles in EVE. But as I recall, their massive alcohol consumption was not always so prevalent, especially when the show appeared on EVE Radio. The player-run internet radio station runs on listener contributions and one way that BigCountry and crew raised funds was by drinking for donations. My first interaction with BC occurred during the first SomerBlink money laundering scandal. BigCountry, in his usual way, was ripping on everyone who said disparaging things about the gambling site. He had a point. A lot of people were saying things without documentation. But I wasn't one of them. I called in to discuss the issue and sent BC some documentation. He still defended Somer, but had to admit I knew what I was talking about. Of course, just because I was right once didn't stop him from telling me I was wrong afterwards. As I said before, BigCountry was never shy about expressing his opinions. BigCountry's journey through EVE ran the gamut, from a member of a Russian renter alliance to the CFC and finally Pandemic Legion. Along the way, his broadcasting activities touched literally thousands of players, if only for a few moments of listening to music back in the days before Pandora and Spotify. Honestly, I can't include all the good things people posted about BigCountry. But I can let everyone know about an effort to help BC's family. He left behind a wife, Megan, an eight-year-old daughter Taylor, and a six-year-old son Carson. Dirk set up a Gofundme to help out the family. If anyone would like to make a donation, the link is https://www.gofundme.com/jeff-bigcountry-waltman-fund. Check-out time at the hotel is in a couple of hours, so now is a good time to take stock of what happened in the conference rooms in Planet Hollywood. Alpha clone state looks promising. CCP wants new players to view the free-to-play, alpha clone state as a viable long-term option. CCP Rise gave a presentation based on his experience running around Tranquility in a character with the alpha clone skillset. Not only did he maintain a 67% kill efficiency, but he could afford to lost 35 ships while doing so. Admittedly, he was a long time player before becoming a developer, so the question is: can a new player with no experience survive and thrive in New Eden? That depends on the New Player Experience (NPE). The New Player Experience looks promising. CCP Ghost presented a compelling case that the new NPE is a much better experience than the current content. Most current and former players will say that is a low bar to clear. The former Icelandic criminal investigator explained the importance of story to human learning and stepped through the logic of one segment of the NPE. Admittedly, I have not run through the NPE on Singularity, opting to wait until Ascension launches on 15 November. I still have a concern about the reaction of new players to the end of the NPE. Will new players feel they are the subject of a bait-and-switch once the voice acting ends and the sandbox begins? I think CCP realizes they need more of a transition, but I doubt a planned part 2 is ready enough for deployment in two weeks. Then again, perhaps that is reason for the one week delay in deploying the expansion. Game companies only get to introduce a free-to-play/freemium option once, so hopefully new players will stick around. New Eden is getting more populous (and more dangerous). CCP presented some additional information about the increasing capabilities of EVE's artificial intelligence. The mining operations will act as much like players as possible, including DPS anchoring on a fleet commander and logistics (yes, logi!) trying to keep the main NPC fleet between players and themselves. The composition of response fleets will depend on the level of the player threat to the mining fleet. Then again, a player with good standings to the NPC corporation running the mining operation may even receive aid in case of attack from another player. For the foreseeable future, the old dumb NPCs will co-exist with groups using the improved AI. But I expect that eventually, the new code (which apparently uses less server resources) to squeeze out the older NPCs. The Star Citizen vulnerability window is closed. Throughout 2015, I looked at the state of EVE and thought that the launch of Star Citizen could entice a large portion of EVE's player-base away from the game. Originally scheduled to launch in November 2014, the game promised better graphics, a world filled with NPCs that fought like players, and an economy made more vibrant using the actions of NPCs. EVE Vegas showed that CCP has closed the gap on all of these concerns. The level of art detail in EVE has now reached the level of improved explosions and prettier wrecks. Smart AI is no longer limited to special bad guys like Sansha incursions, Sleepers, and Drifters. Finally, the world, both in the form of NPCs and additional players, will feel more alive than ever. If anything, Star Citizen will suffer in comparison based on the limited number of people who can play together at any one time compared to the hundreds that EVE can currently support. EVE might suffer due to players wanting the space-fighter or FPS ground combat experience, but on most other levels CCP will have caught up to Chris Roberts' vision, as far as I can tell, by the time Star Citizen officially launches in 2018. Those are just some quick thoughts on the information provided here on the ground in Las Vegas. Now I have to finish packing and check out of the hotel. Last night I made a brief appearance on the Open Comms Show and apparently made some comments in regards to skins gambling I should develop into a full post or two. Some of my comments resulted from my real world belief that established interests lobby for government regulation in order to secure their economic position. One just has to watch the news for how taxi cab companies lobby against Uber and Lyft for examples. Similar regulatory efforts backed by the hotel industry are underway against AirBnB. In EVE, we call this Malcanis' Law. Where skins gambling, the category of operation that EVE casinos fell into, is concerned, the established real world interests are the brick-and-mortar casinos. If large amounts of money are wagered outside the casinos, the gambling interests have an interest in getting a piece of the action. Skins gambling, almost if not totally unregulated up until this summer, is such an activity. Up until the legal actions swirling around Valve, one of the leading experts in the field, Chris Grove of Narus Advisors, estimated to grow to become a $20 billion industry in the year 2020. Indeed, one site, CSGOLounge, handled $1 billion in bets in 2016 before Valve began issuing cease-and-desist letters in August. To give some perspective on the amount, in 2014 gambling casinos and other gambling activities run by native Americans generated $26.8 billion. So $20 billion is a lot. I'm currently in Las Vegas attending the CCP event in Planet Hollywood, so I don't have a lot of time or access to my locally stored reference materials to flesh out the subject with the word count it deserves. Just know that, like EVE itself, a lot of action is occurring below the surface. "We pay our writers 250 million ISK per article, podcast or video, and 150m for editing. Every article you see on CZ takes between three to ten man hours of work to produce. Outside of that, there is a large amount of administrative work and research that needs to be done, all of which allows us to offer an experience to our readers and listeners that far exceeds what any individual blog might provide." I should feel really good right now. Professionally, my boss went on paternity leave for three weeks, leaving me in charge. All emergencies handled, the servers didn't melt, and he sounded happy after I debriefed him on what he missed. Which is all good, because my review is coming up. Cha ching! Outside of work, I land in Las Vegas at 9:10 am Thursday, local time. I'll spend four days talking internet spaceships with people I've met at previous meetups as well as with new people I don't know yet. Perhaps more importantly, I'll get to go to Holsteins and get one of their milkshakes. Yum! Despite all the positivity in the air, I feel like a cloud has settled over my head. A cloud the likes not seen since the great ISBoxer meltdown of 2014-2015. CCP announced a EULA change taking effect on 8 November that bans EVE gambling sites. And just like with the enforcement of the rules involving input broadcasting and input multiplexing on 1 January 2015, a small segment of the EVE player base is up in arms over CCP's decision. A feeling of deja vu struck me as I watched my Twitter feed yesterday. First came a post on Crossing Zebras wrapping "EVE media" in the community flag. One argument is that, "it’s time for some of these players that have amassed an incredible wealth to give back to the community." Really? Amassing wealth in a video game leads to social obligations to those who want funds? We play a video game, for Bob's sake. Anyone trying to guilt trip me over having a lot of virtual currency in a video game gets laughed at. Of course, I guess I need to have a lot of ISK first. "The rest could be used by CCP to sponsor external sites, like Crossing Zebras or like EN:24, which would be telling the stories of players to the world, act as a source of advertising for the game, as well as holding CCP accountable when they release new game features." Seriously? Does anyone expect a news site paid for by CCP to criticize CCP? Eve News 24 couldn't even criticize I WANT ISK, a major sponsor, whenever the gambling site fell afoul of the EVE Online EULA. Besides, CCP is ending gambling in part due to a movement among governments to crack down on skins gambling done by third party sites. Is CCP going to risk running afoul of violating those same laws directly? I think not. A little later, Niden's bleg appeared in my Twitter feed. Perhaps the first post from Crossing Zebras put me in a foul mood. Or perhaps the combination of the bleg combined with Niden's and Nashh Kadavr's appearance on Talking in Stations set me off. But I couldn't help but think of the reaction of ISBoxer users. In some ways, the reactions of those who profited from the largess of EVE casinos is more egregious than that of hyper-boxers who used input broadcasting and multiplexing. In the case of ISBoxer users, they loudly proclaimed that they brought so much money into EVE that CCP needed to balance the game around them. The EVE media types and other content creators addicted to gambling money not only argue that CCP needs to balance the game around gambling, but the developers also need to take legal risks to allow them to continue their activities. And if CCP insists on banning gambling, then the developers need to replace the lost income somehow, or bad things will happen that will damage the game. I still remember the months-long fights over the input broadcasting and multiplexing bans. I really don't want to live through another period like that. Something tells me that, since the EVE media has a much greater reach than ISBoxer users, I may not find an escape short of just abandoning all EVE sites. "Get your taste of fall at Holsteins with the Pumpkin Pie Bam-Boozled Shake, a pumpkin spice blend of vanilla ice cream, pumpkin vodka, pumpkin pie filling and graham crackers, garnished with vanilla frosting, a candy corn rim, whipped cream and a slide of pumpkin pie." I can feel my mood improving already.